I had a lot of fun with this sketch! 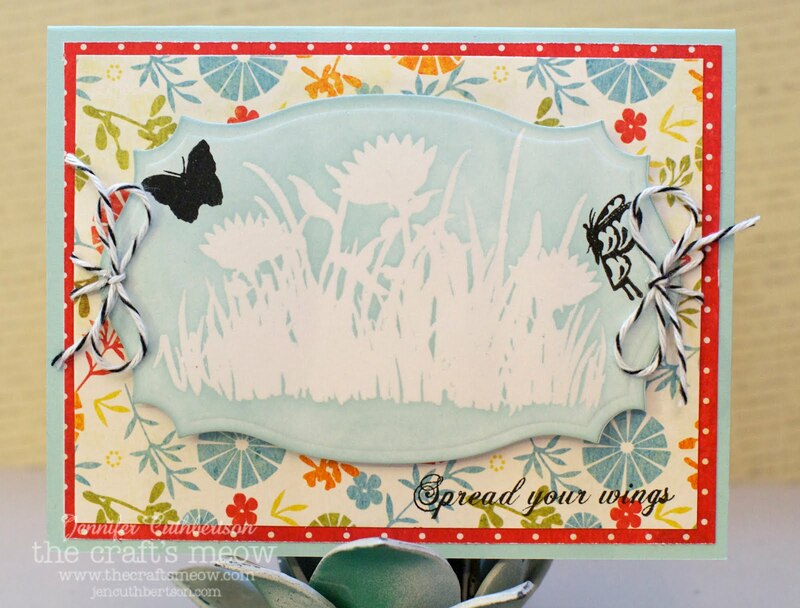 I started off by stamping a cream panel with the background stamp from Paris Nouveau and then stamped the corner with the "merci" sentiment. 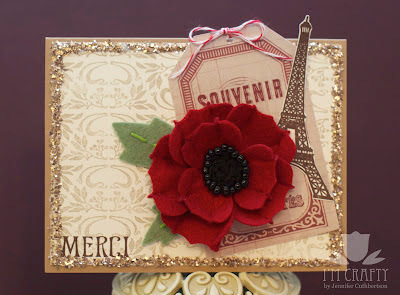 I thought it needed a little something so I applied some champagne glass glitter around the edges and finished the card with a tag, felt flower, and that wonderful Eiffel Tower from the Paris Nouveau set. Link up by Friday for a chance to be crowned Top Mouse and remember, one lucky participant will win a set of their choice! Hello friends! 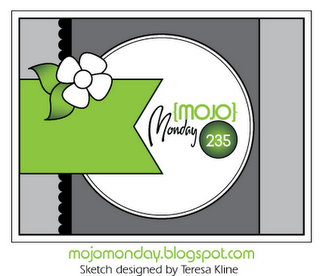 Today I have a card to share that I made for this week's Tuesday Trigger over at the Moxie Fab World! I took a layout class a couple of weekends ago taught by the fabulous Kelly Purkey where she taught me to fearlessly use spritz sprays - yikes! Talk about out of my comfort zone. Anyway, when I saw this fabulous photo, I decided to give it a try! 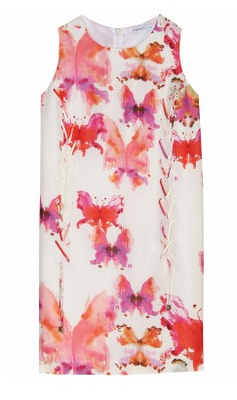 I thought the technique of the wet spritz was an interesting take on the watercolor look of the dress and I love the coral and pinks of the butterflies! I started by using some butterfly stickers as a mask and then spritzed two colors of Mister Huey (Taxi and Boss Lady) over the whole white panel. After it dried, I removed the stickers to reveal the silhouettes underneath. Fun! I finished the card with a sentiment and a few gems/pearls. 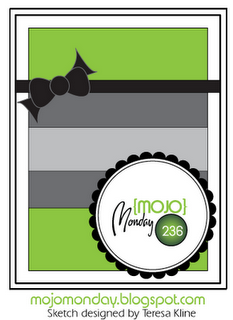 I love the colors of the inspiration photo and chose to make a tag using Button Boutique and some of my felt stash! I stamped a few button images onto a piece of pink paper and embossed them with white embossing powder, stamped two button cards and distressed them with some dye ink. 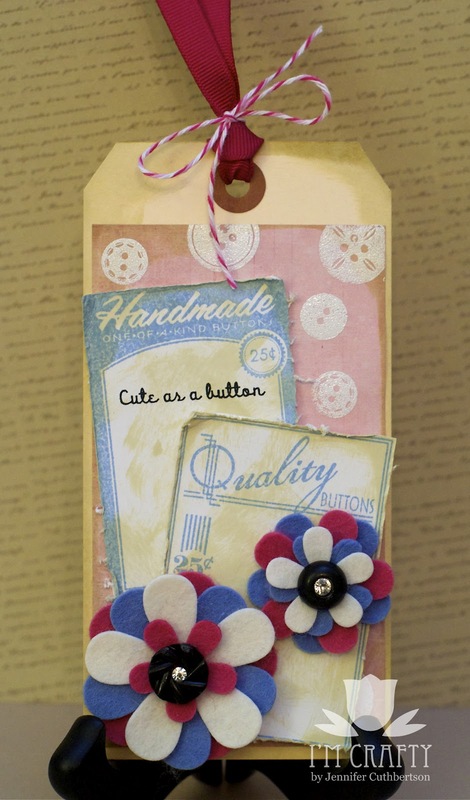 I finished the tag with two felt flowers topped with vintage buttons from my stash. This is my 3rd post of the day (wow!) 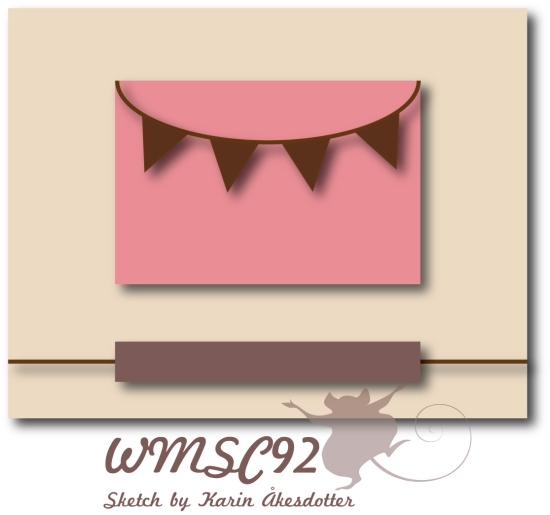 If you're looking for The Craft's Meow blog hop or my Waltzingmouse Sketch Challenge card, please scroll down. Hello friends! 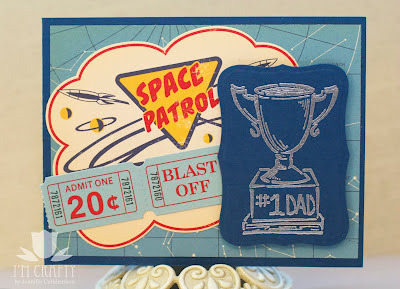 Today is our Rubbernecker Stamps Father's Day blog hop! If you're like me and you need more "man card" ideas, this tour is sure to give you some great inspiration! I started off with the great #1 Dad Trophy stamp and heat embossed it onto some navy cardstock. I cut it out with a lable die and adhered it atop some paper and some fun embellishments from the Rocket Age collection. 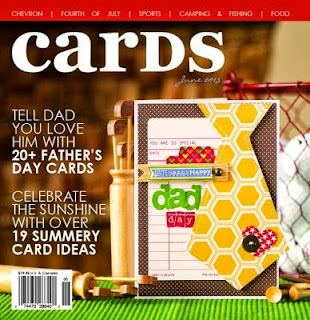 One of my dad's favorite card's I've made was one published in the December issue of Cards Magazine so I thought I'd give him a Father's Day card that was of the same theme. I sure hope he likes it! 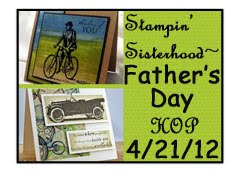 I've included the hop route below and if you leave comments along the way and then on the Stampin' Sisterhood blog, you'll be eligible to win a stamp set of your choice! The winner will be randomly selected from comments and announced on the SS Blog on 4/28! Leave another comment that you've shared our hop on your Facebook page or blog for a 2nd chance to win! The Craft's Meow - April Release Blog Hop! Hello friends, today is release day at The Craft's Meow and I hope you're loving what you're seeing!! If you're here from Jean's blog , you're in the right spot. If not, head over to the TCM blog to get started! All of these sets have been such fun to work with and are now available for purchase at the store! Don't forget, "Giddy Up" is free with any $50 purchase! 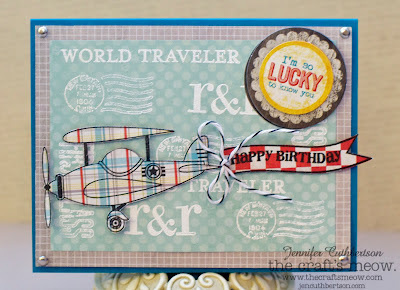 For my blog hop card, I used Travel Time and Vintage Rides to make this birthday card! I stamped the words from Travel Time onto a sheet of patterned paper and then embossed them with white embossing powder. 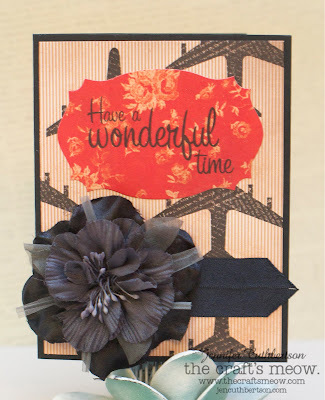 I stamped and fussy cut the plane (how cute is it?!?!) 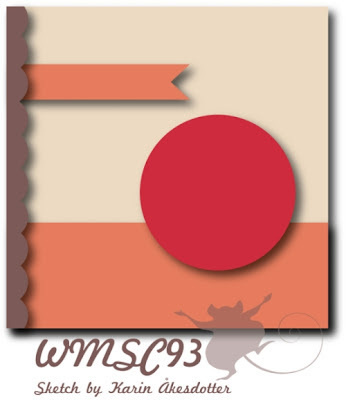 and the banner from coordinating papers and finished the card with a layered sticker from the same paper collection. And of course, it can't be a release party without a prize, right?!!? One lucky participant will win all 6 sets from this release and all you have to do to be eligible is comment on each of the blogs in our hop by 9pm PDT on 4/23! Easy peasy!! Thanks so much for visiting - off you go to Jenny's blog! Anyway, here is the card I made for this week's Waltzingmouse Sketch Challenge based on this wonderful sketch by Karin! I have a couple of other posts scheduled for today so we'll see what happens! :) Have a wonderful day! The Craft's Meow - April Preview Day Four! Hello friends! It's new release time at The Craft's Meow and this month there are six wonderful new stamp sets we'll be showing you over the next few days that will be revealed in full and available for purchase beginning on the 21st! 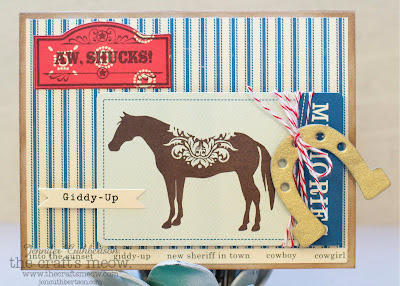 Today we're previewing "Giddy Up" designed by Nina Brackett! One super duper thing about this set is that it will be yours free with any $50 purchase! Cool! I started with a kraft card base and layered the striped paper from the Sasparilla collection over the top and stamped the label shape and the "Aw, shucks!" sentiment onto a red bandanna print, cut it out and added it to the card. I stamped the horse image from the set onto a journaling card and tied it with some twine. 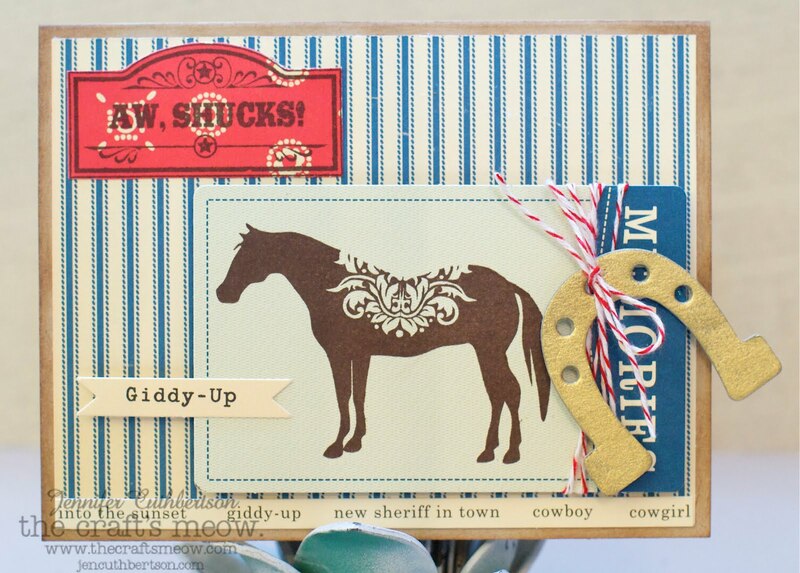 I finished the card with a chipboard horseshoe that I sponged with gold ink. The Craft's Meow - April Preview Day Three! Hello friends! It's new release time at The Craft's Meow and this month there are six wonderful new stamp sets we'll be showing you over the next few days that will be revealed in full and available for purchase beginning on the 21st! 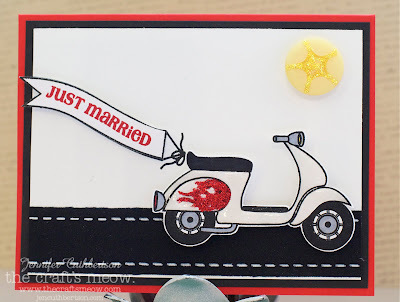 This card features the fun scooter, banner, and sentiment from Vintage Rides designed by Nina Brackett! I had to choose the scooter (there is also a bicycle and a vintage car in the set) because I ride a vespa! I used some stickles to color the flames and then used Glossy Accents over the white cardstock for the scooter body to give it some sheen. Of course I used white for the wedding getaway vehicle! 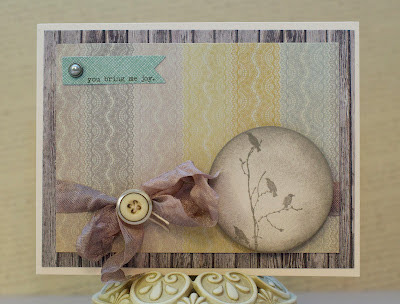 :) I finished the card with a fabric tape "road" and a vintage button "sun." For this card I used Owl Journaling by Jenny Suchin! This set has a large owl with many sentiments you can use for his belly and several pennant and other journaling options. 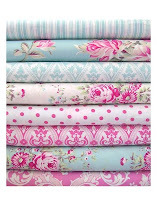 This set would be perfect to add stamped touches to scrapbooking pages and is perfect for cards, too! 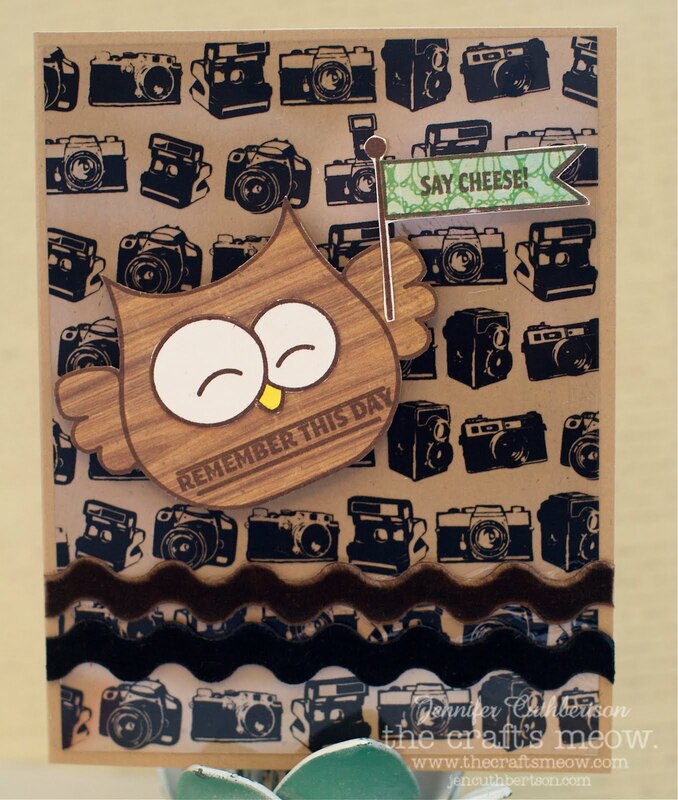 I pieced the owl and pennant over an acetate sheet decorated with cameras. A perfect pairing for that cute little pennant! Thanks for visiting today and don't forget to head back over tomorrow, too! We have one more set to preview and will let you know how you can get it for free! The Craft's Meow - April Preview Day Two! 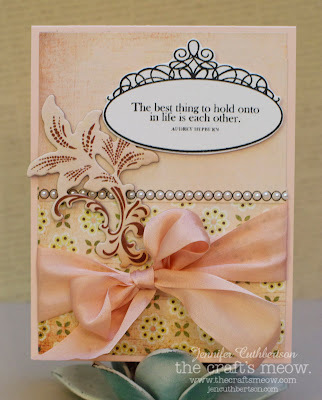 Today I'm previewing "Inspired by Audrey" designed by Karen Baker! This set has some wonderful quotes from Audrey Hepburn and several images you can combine to make some wonderful backgrounds! I stamped the crown image onto some white cardstock, stamped a sentiment in the center, and then fussy cut it out. 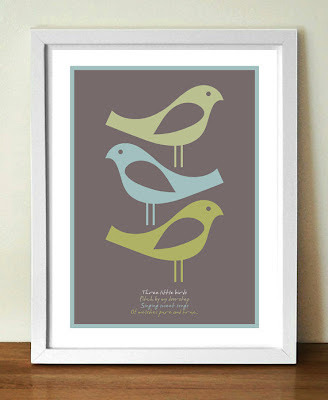 I was inspired by the sentiment and thought it would make a lovely wedding card! I stamped the "pearl" stamp in the center and then added some small adhesive pearls into the centers for more pop. 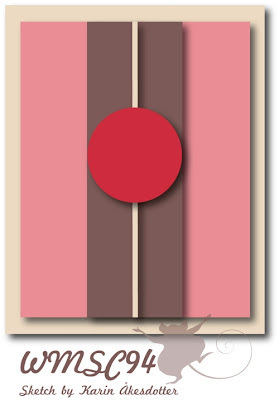 I finished the card with a big champagne silk ribbon and a die cut from the paper collection! I hope you've enjoyed today's preview and I'll see you back tomorrow with a couple more! 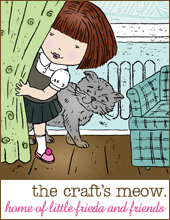 The Craft's Meow - April Preview Day One! 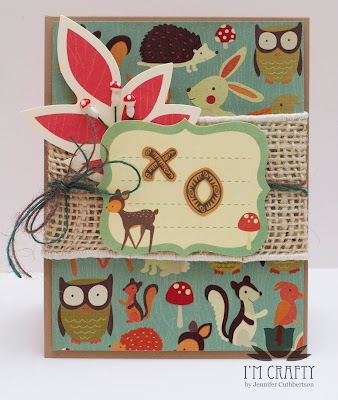 The first card I have to show you was made using the wonderful Nature's Beauty set designed by Michelle Bertuzzi! I chose the large garden silhouette image and embossed it onto white cardstock using clear embossing powder. Once I cut the label, I sponged over the image with some sky blue ink and wiped the ink off of the embossing. I love how crisp and white the image turned out! 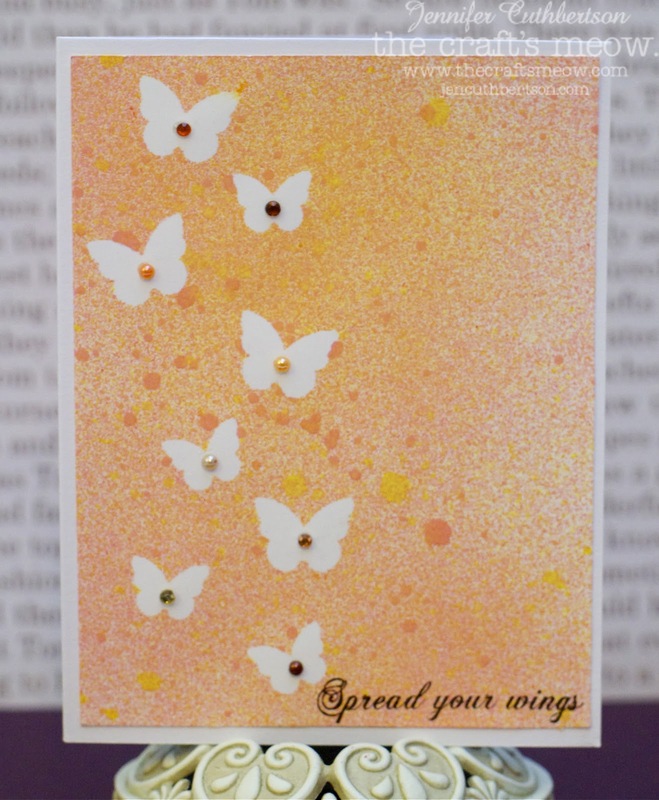 I layered the image over a couple of sheets of coordinating papers and then stamped the little butterflies on the sides and the "spread your wings" sentiment at the bottom. This second card features the Travel Time set designed by Kaitlyn Ord! 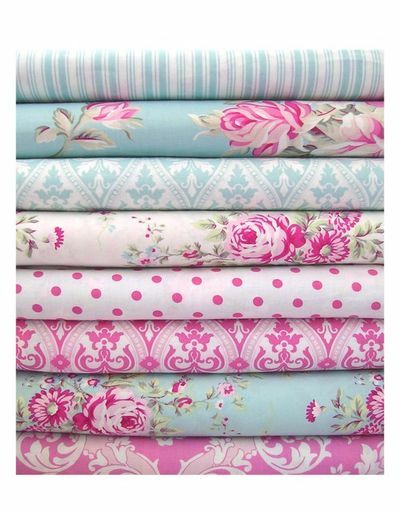 This set would be perfect for scrapbooking, too! 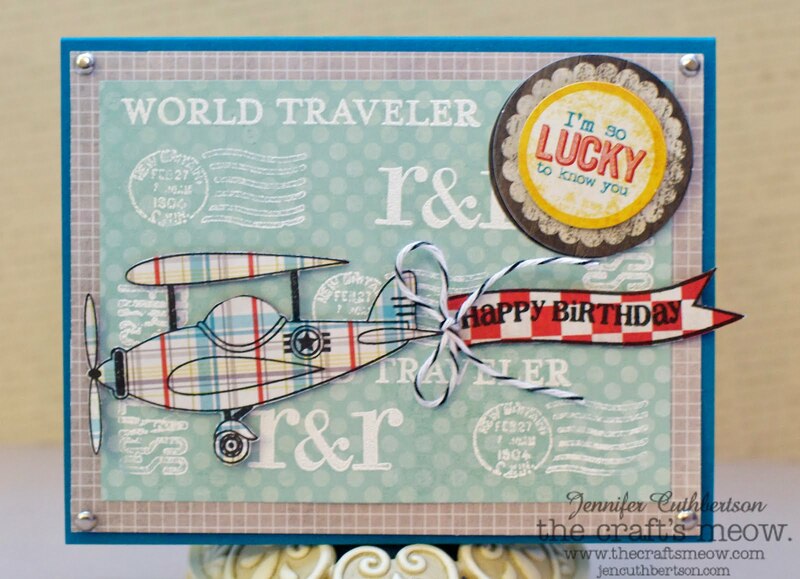 I started off with a couple of sheets of patterned paper and stamped the airplane image on the first one. I think it is pretty clear in the photo but the airplane (as well as a cruise ship in the same set) has a newsprinty pattern it it - it is not a solid stamp. Pretty cool, eh? I stamped one of the sentiments onto a coordinating piece of paper and then cut it out using Labels 25. Can you tell it is one of my favorites these days? 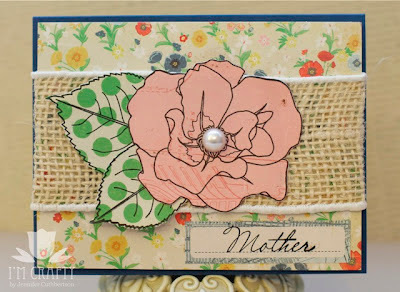 :) I finished the card with a large flower from Prima and some satin ribbon! I'm excited to hear what you think of these sets and I'll have another preview for you tomorrrow! I started off with some new My Mind's Eye papers, and a fantastic "Birds in Trees" stamp from Rubbernecker Stamps. The stamp is quite large and could easily fill an A2 card but I chose to cut out just a portion of it using a circle die. I sponged around the image using gray ink to compliment the papers and finished the card with some gray shabby ribbon and a vintage button. My coworker lost her brother in law last weekend and I made this card to send to her family. 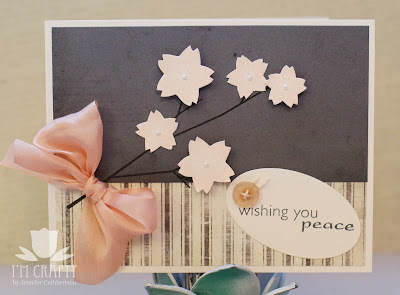 I layered two papers from the French Kiss collection and stamped a sentiment and the cherry blossoms/branch from Asian Gardens. 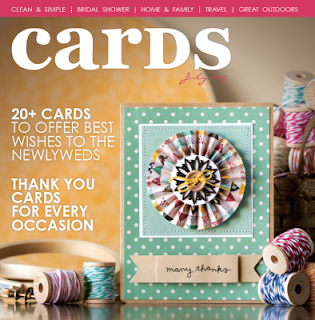 I finished the card with a gorgeous, silk bow and some tiny pearls. I hope they can find some peace during this difficult time. I'm looking forward to seeing what you make with this beautiful sketch! Link up by Friday for a chance to be crowned Top Mouse. And, don't forget...one lucky, random participant will win the stamp set of their choosing! Hello friends! 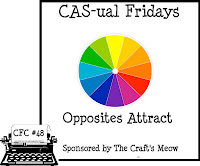 Today I'm happy to share a card with you that I made for this week's challenge at CAS-ual Fridays, "opposites attract." This week, The Craft's Meow is sponsoring the challenge and the lucky winner will receive a TCM stamp set of their choice!! I chose red and green to highlight the wonderful images from Beautiful Spring! 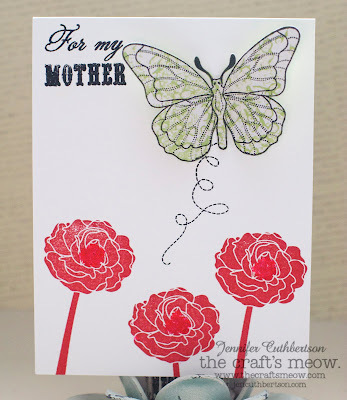 I stamped the flowers in red and then pieced the butterfly from some wonderful patterned paper. It's tough to tell from the photo but the butterfly is pieced and the wings are folded up off of the card base and added some micro beads to the flower centers for some dimension. 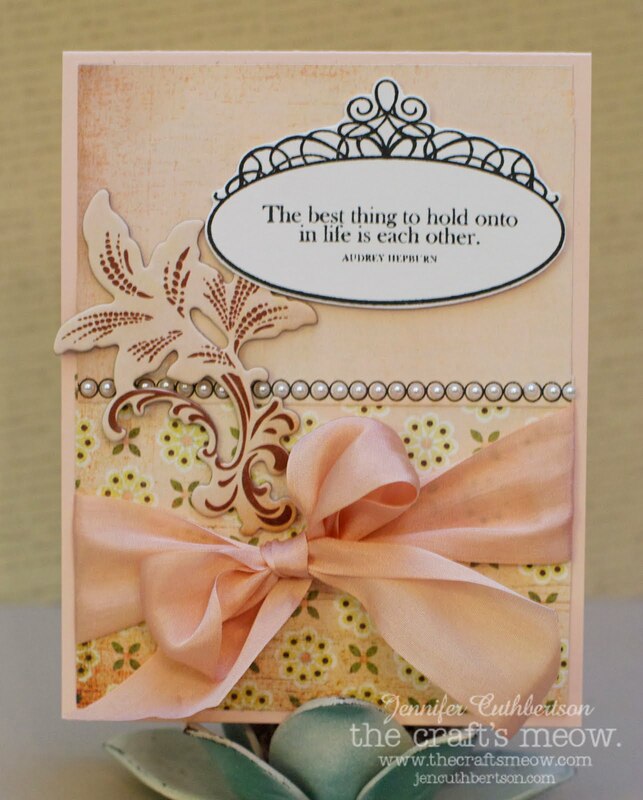 I finished the card with a sentiment from Cherished. Thanks for visiting today and good luck!! Hello friends, today I have an exciting giveaway to tell you about! I've had a couple of Etsy shops for a while now where I sell my cards and extra supplies (has anyone besides me ever purchased duplicates because they couldn't find something in the mountains of stuff in their craft room?) :) Well, I'm honored to be part of a team on Etsy of amazing greeting card artists and we're having a big giveaway from now through the 23rd! Head over to our blog for more details! 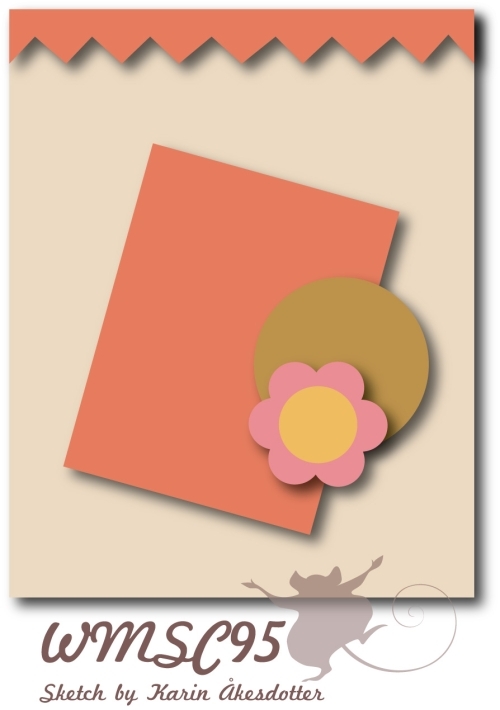 In addition to the giveaway, participating artists have spotlighted Mother's Day cards! There are some real beauties out there! 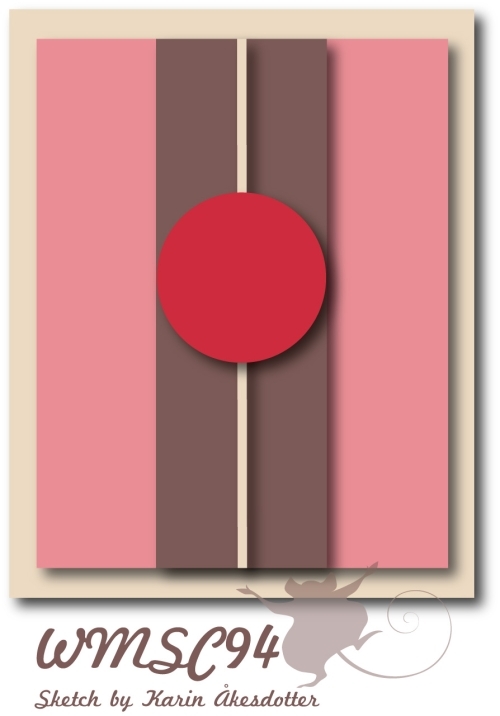 Have a great day and I'll be back tomorrow with another card to share! Hello friends! 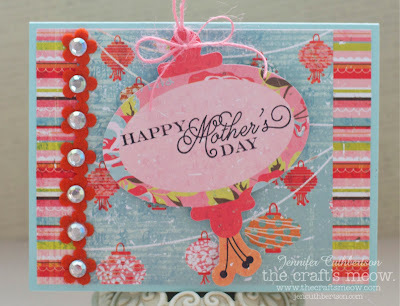 Today I have a fun card to share with you that I made using some new papers from Kaisercraft and a few scraps I had around the house. 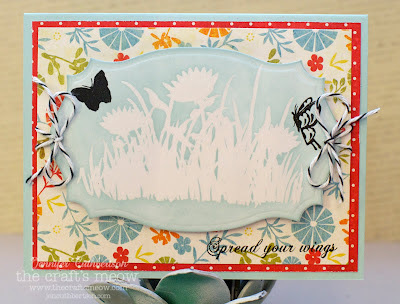 I thought it would be perfect for the "Don't Throw it Away" challenge at Moxie Fab World! 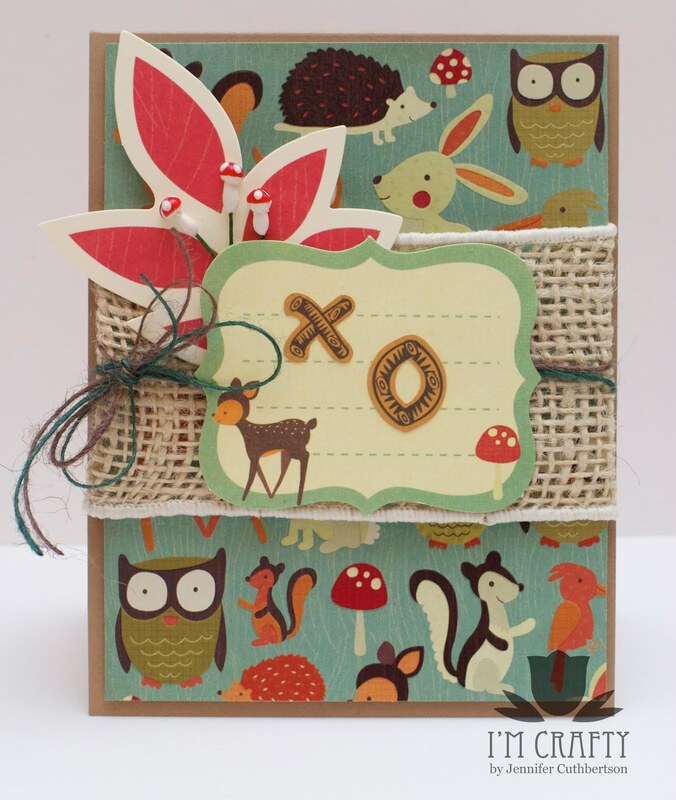 I started off with a kraft card base and layered that cute woodland animal print paper on top. I used a scrap of burlap and some twine that were leftover from some gift wrapping (I never throw any of that stuff away anymore! ), and finished the card with a journaling card, a leaf die cut, and a sprig of little toadstools I've had kicking around for a while. Thanks for inspiring me to use my scraps, Cath! I know today is Easter but I don't have any new Easter cards to share with you so I have a Mother's Day card to share instead! Before I get to it, I wanted to wish you all a wonderful Easter! We went to a beautiful service on Mt. Davidson here in San Francisco - such a glorious day! He is risen! I've been loving my new Konnichiwa papers and couldn't resist pulling them out for this springy card based on this week's sketch from Mojo Monday - I love the big lantern die cut and stamped it with a sentiment from the Mother and Father set from The Craft's Meow, layered it atop a couple of matching patterned papers, and finished the card with coordinating felt trim. 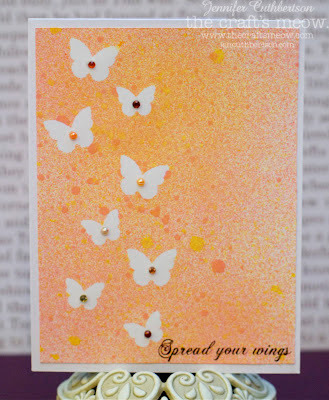 I knew straight away that I wanted to use my new Konnichiwa papers (I LOVE them - so springy!!) and thought the lanterns from Asian Gardens/Additions would be perfect! I used two sheets of coordinating paper and added chunky glitter around the smaller panel. I stamped/embossed the lanterns with silver powder, popped them up, and "strung" them with some burlap twine. I finished the card with a couple of brads and a congrats sentiment. Link up by Friday for a chance to be crowned Top Mouse and remember, one random participant will win the stamp set of their choice!